Landscape is an essential part of most westerns and this weekend we traveled to the Texas Hill Country around Mason in search of Lupinus texensis, better known as the Texas Bluebonnet. 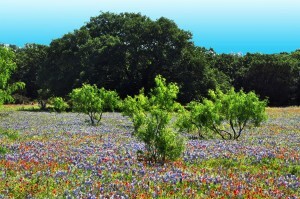 Yes, who can live in Texas without going on a wildflower safari each spring? Based on our drives through the Hill Country over the last 15 years since we moved to San Angelo, this year’s crop was only exceeded by that of 2004. We were likely a week to 10 days past this year’s prime growth, but it was still a beautiful splash of color across the meadows and hills made green by spring rains. The Bluebonnet has been the state flower of Texas since 1901 when the 27th Texas Legislature designated the native plant as such. 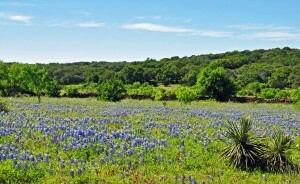 The Lupinus texensis is one of the state’s five native bluebonnet species, all of which were officially made state flowers by the Texas Legislature in 1971. Legend says the Spanish priests who came to Texas loved the flower and planted it around their missions, naming it el conejo or the rabbit. It took its common English name from the resemblance of its petals to the bonnets of pioneer women, who loved the flower’s subtle spring colors in a land that was often harsh and unforgiving. Until the 1930s, the Bluebonnet’s range was limited to certain areas of the state, but during the Great Depression the Texas Highway Department began to beautify the state’s highways by planting seeds on the right of way. In the 1960s Lady Bird Johnson’s highway beautification program furthered the reach of the legume, a family of plants that includes mesquite, peas, beans, alfalfa and peanuts, among others. Today the bluebonnets are found throughout most of Texas along major and minor highways where their soft and dark blues provide a delicate canvas that makes the vibrant colors of the Indian Paintbrush, Indian Blanket, Buttercups and others that share the roadside. To see how they appeared to the early Texas settlers, you have to leave the main thoroughfares for rural and even private roads. 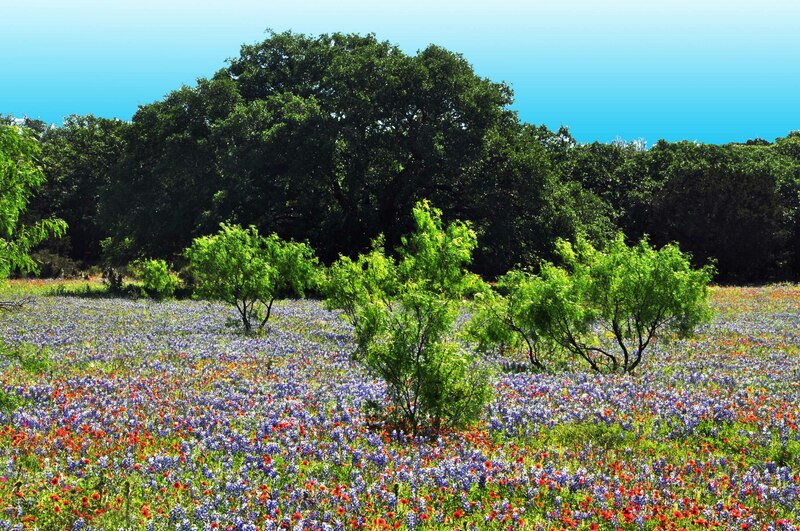 To help visitors find wildflowers in their natural setting, the Mason Chamber of Commerce provides directions to three routes that help you discover Texas wildflowers in their natural environments. We took routes two and three. The results were worth it, providing a step back in time to the days when the land was as wild as the flowers. Though the land has been tamed by modernity, the flowers remain as wild as ever and their beauty only truly appreciated when you pass them at 20 rather than 70 miles an hour and take the time to walk among them with your camera.